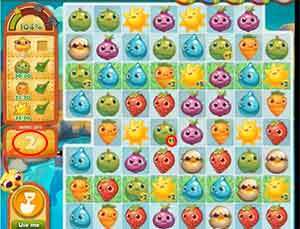 These Farm Heroes level 80 cheats and tips will help you beat level 80 of Farm Heroes. 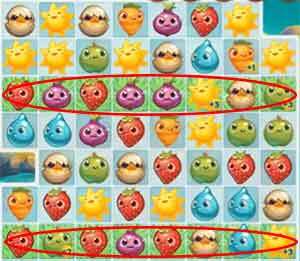 The objective of Farm Heroes level 80 is to gather 2 Chickens, 30 Green Apples, 30 Carrots and 30 Suns in just 14 moves. Making matches in the grassy areas will help to give you more points for matches that you make. Remember, you have very limited amount of moves. Making matches in the grassy area is going to be key in helping you pass the level 80. When you make matches in the grassy areas, the number of cropsies that get collected gets a boost, thus helping your chances to accomplish the goals in this level in the limited amount of moves. Because you need to collect 90 cropsies in only 14 moves, making matches in grassy areas is a must. You need to focus on getting the cropsies, before you focus on getting the chickens. You only need 2 chickens to pass the level. And while you’re making other matches, the chickens will probbaly get locked into a match, as you make others. That should be your last focus. 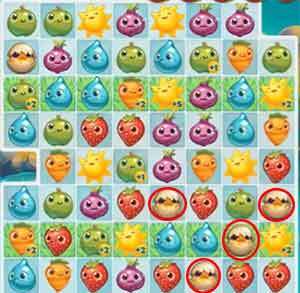 Because you are required to collect 90 cropsies, you are bound to make a match next to an egg and begin to crack it. If you are close to making a chick hatch, but one of the eggs isn’t cracked, you can hit it with a shovel so it will crack and be ready to combine with the other 2 cracked eggs and hatch a chick. Boosters should always be used in levels where you have very limited amount of moves to use. If you go the route of using boosters, fill up most of your items half-way, and then focus on getting the 2 chickens. Then once you have them, use the +1 booster and get all the remaining cropsies you need to beat level 80. Shovels can also be used to dig up cropsies in addition to cracking eggs. Use this in grassy areas where you can make a big match, but there is one cropsie out of place and needs to be dug up.